Gosh! Full cream (wonder how natural or if reprocessed or even an artificial cream substitute used) milk now at an effective 75 cents per litre to the end consumer. Maybe, just maybe, skinny or skim milk where other elements of the raw milk (e.g. fat, protein, casein, whey, other carbohydrates etc.) can be extracted and processed for other higher yielding saleable products and lower cost base substitutes put in their place. So what exactly is the “product” being offered at 75 cents a litre? I don’t think it’s at the cost of the product, it’s at the cost of the farmers. Why don’t you think it’s at the cost of the product? If milk was pure, and unadulterated, why have I been drinking soy for 10 years thinking I had a lactose problem? Why now do I have no problem drinking pure, unhomogonized milk fresh from a local dairy? The milk is being processed and messed around with, and we are all suffering. I don’t know Melody. What I do know is that to become an Australian milk processor is one of the most convoluted, highly regulated processes you could imagine. I don’t think they “get away” with anything! How About Keeping It 4Real? This isn’t about making a profit (obviously) … it’s about sending farmers broke. And the current $1 per litre is doing that just fine. Imagine how many farmers can go broke at $0.75 per litre? Way to go Suits! To deals like this I say “down, down, my thumb is going down” and as for actually supporting this with my hard earned cash … I think I’ll just keep it “4Real” thanks very much. I can only talk about my own co-op Norco (proudly) with confidence knowing that when the management and directors do a deal they do so knowing that it delivers a profit back to us the supplier shareholders. A recent 3 cent a litre price rise has made us one of if not the highest paid dairy farmers in Australia. I would expect an extra 1cent step up though the year as well. Our own personel price after quality bonuses should be about 63 cents per litre. Norco has spent a lot of money on upgrades in our milk plants as well.How can other milk companies think it is alright to devalue a high value product. Maybe it is time for a “bit of an explore” by say ummm 4 Corners or some other investigative entity to uncover what really is contained in the $1 or less per litre milk we are getting. They could do a double hit, with the first being the make-up and content of the liquid being sold as “milk” compared to more expensive branded milks and secondly see if they could get to the bottom line of who really is creaming (excuse the pun) who in the price war or whether it is just skimming off the top by everyone but the farmer. Anecdotal evidence for both of these is rife across the community and finger pointing is rampant. There is no one dairy farmer getting hit by this nor is there just one processor getting the large share of supermarket contracts and it is shared across 2 supermarkets that do control the vast majority of the supermarket spend in this country. So maybe it is a combination of factors that are contributing but it certainly seems the supplier is the one getting hit the hardest. Time for a bit of honesty and integrity in the answers and true transparency of the results. However I have to say I can’t see too many processors or the supermarkets wanting to stump up the data for an independent assessment and for all to see. I just find it staggering that milk is cheaper than bottled water and yet the input costs for dairy would be multiples beyond bottled water. It makes my stomach drop when I read this. I don’t understand how MG fail to understand the risk in what they are doing, not just for the farmers, but also for the rural communities that these families and businesses support. Regardless of this, I hope that you and your family are well Marian! It looks like Mr Helou is going to spit that milk out! 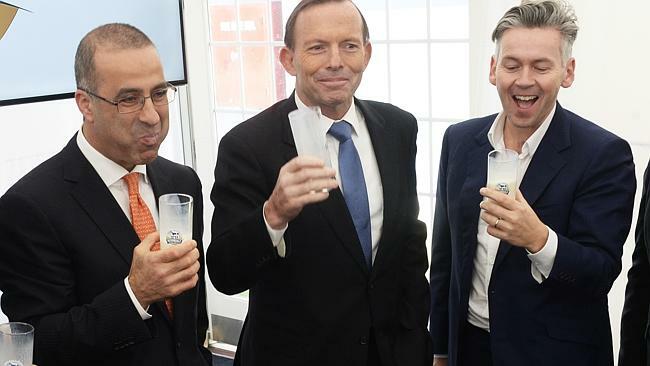 That’s because he didn’t realise what $1 litre milk tasted like! He always got very fresh, top shelf stuff until then.